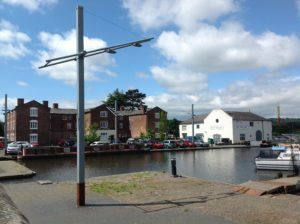 Stourport Basin still has a lot of its Georgian buildings including the Tontine. 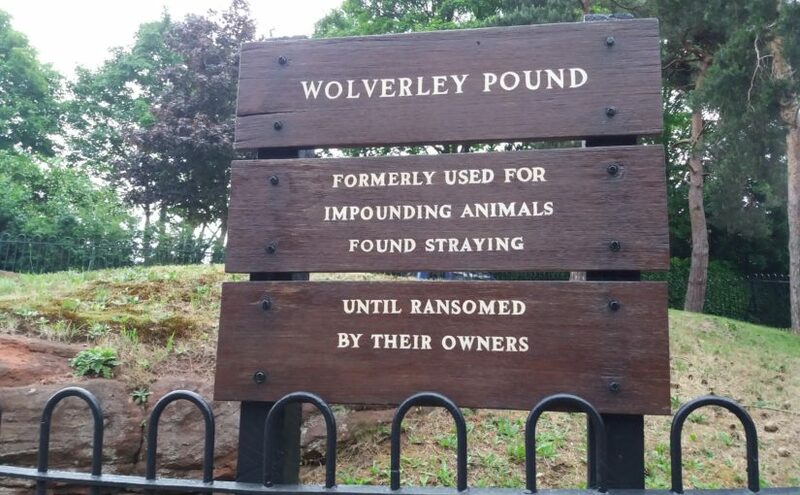 As there’s a Tontine Hotel in Ironbridge, it got me wondering whether it was something specific to the river Severn. However it is not…. Broadly speaking, it’s a 17th century investment scheme that combines an annual annuity for shareholders plus a lottery element because as each subscriber dies, their share is divided between the remaining participants, so the value of the annual annuity increases. So it does pay to be young fit and healthy as last man standing wins the lot. Tontine schemes fell out of favour but are still in existence in various forms though can you imagine the potential for skulldeguery. Or Holywood for that matter. 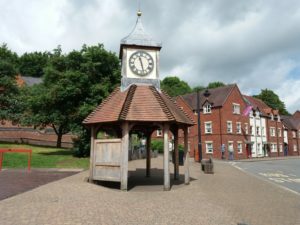 There are are several other Tontine buildings in England and elsewhere in the world. Including the first home of the New York stock exchange which was the Wall Street Tontine coffee shop. 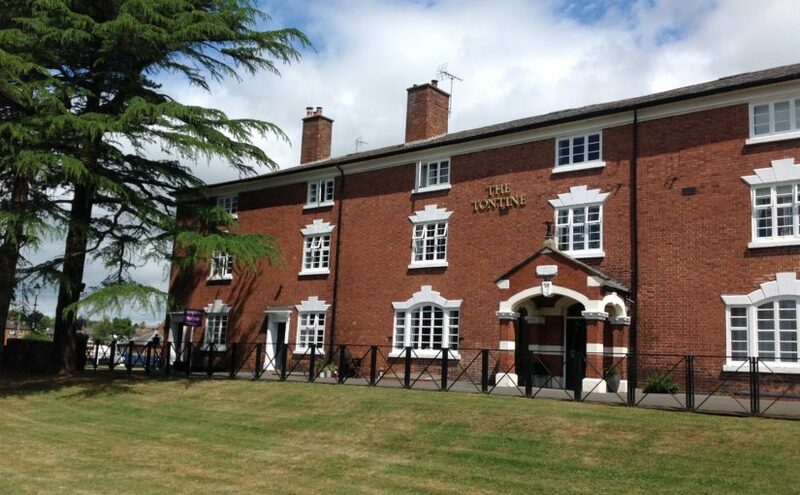 The Stourport Tontine was a hotel called the Stourport Inn, with 100 rooms and a ballroom, but after various guises and a lot of neglect it has been turned into rather nice apartments and as there’s an estate agents board outside one I suspect it’s a safer form of investment. There’s plenty more to read on the internet about Tontines. 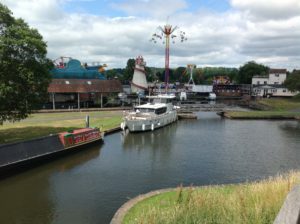 We moored up in the ‘upper basin’ at Stourport on Severn, surrounded by a wealth of canal history. 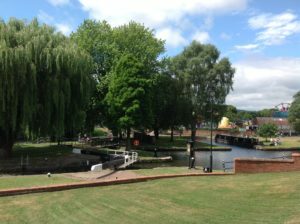 Stourport itself is the first town to be created in conjunction with the development of a canal basin and it was in 1766 that parliament granted permission for the Staffordshire and Worcestershire canal company to create a navigable Cut from the river Severn to the river Trent at Great Heywood. 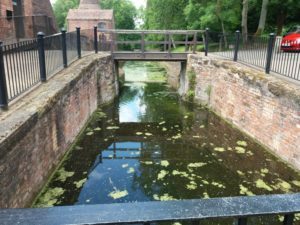 The area was of huge importance for the transport of goods and James Brindley devised a complex interlocking series of basins to allow for loading and unloading from the river to take inland and visa versa. We decide to take advantage of an electric hook up to charge the batteries and run the boat from shore power whilst we enjoy the view, thankful that someone had forgotten the clock, because it usually chimes every quarter hour. 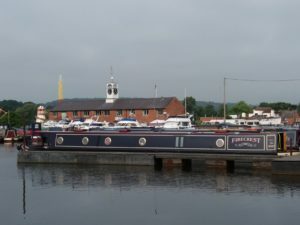 Being a ‘port’ somehow connects Stourport to the sea and therefore it also enjoys all the trappings of a seaside town. Eg numerous fish and chip shops, amusement arcades and a funfare, it makes for a rather interesting place to be. 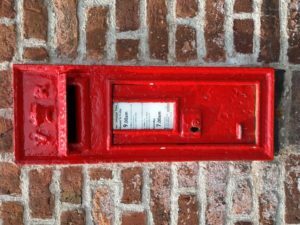 The town is essentially Georgian but the Victorians made the most of Stourport as well as we discovered when sending postcards in this Victorian letter box in wall of the excellent chandlery. 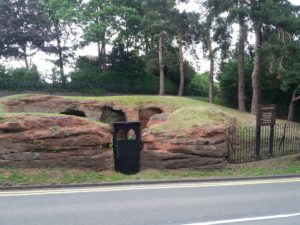 On Sunday Kinver put on a show to be proud of. 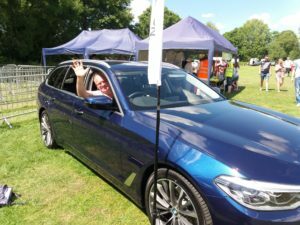 The annual Kinver country Fayre. We slathered on the factor 30, donned our sun hats and set off thankful that the boat would be in shade most of the afternoon. 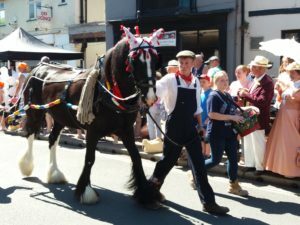 The first event was a transport through the ages parade down the high street. Sadly they couldn’t draw the narrowboat down the highstreet but the bargees and their horse came. 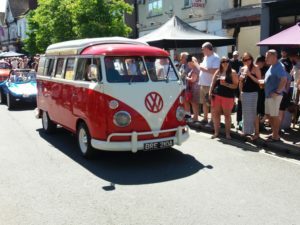 My favourite of the day had to be the beautiful VW Combi, Thanks Dad so many happy memories, I was driven to our wedding in our own 30 years ago. 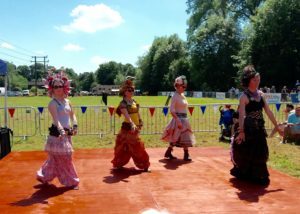 After the parade we moved onto the field with a huge variety of stalls and other entertainments. Eric found the local Brew and got talking to one of the many bobbys around. Sadly we saw 6 armed police officers. 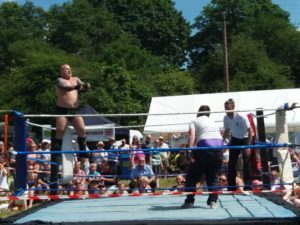 We wouldn’t have batted an eyelid seeing them at an airport or in London but how sad that it’s now deemed necessary for a rural fundraising event. 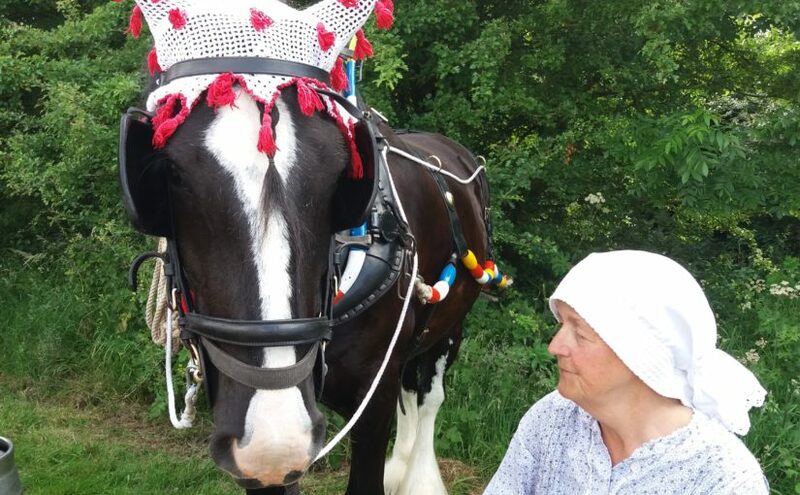 One of our highlights was being able to chat to the family with the barge horse. 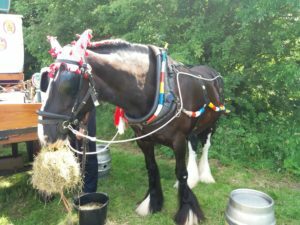 They were ‘Little Shire’ which was very obvious when I saw the full Shires harnessed to the drays. 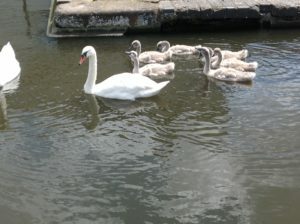 Notably they were bred to have close set hind legs and broad set shoulders to aid pulling the barge along the towpath. They would be no good as ploughing horses because they were used to their loads being pulled at an angle behind them. And their harnesses included rotating ‘bobbins’ that effectively stopped the leather chaffing the horses skin. A bit like horse fenders. I loved the crocheted ears to protect against flies. We stocked up on home made marmalade and other edible delights, then returned to our boat mid afternoon for a siesta. I know we weren’t in the hottest place in the country over the weekend but oh boy was it warm. 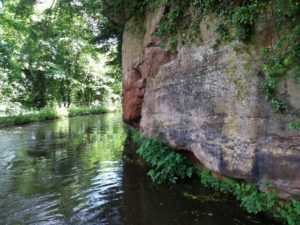 We found a lovely spot at Kinver under a row of shady beech trees, with a family of geese for company. 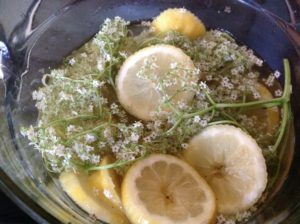 And added them to a sugar syrup (about 700ml boiling water and 300g sugar left to dissolve and cool) Added some lemons (2) and a tablespoon of citric acid(15g) left for 24 hours the strained into bottles. 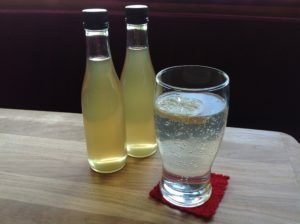 Diluted with fizzy water (or champagne) bliss. 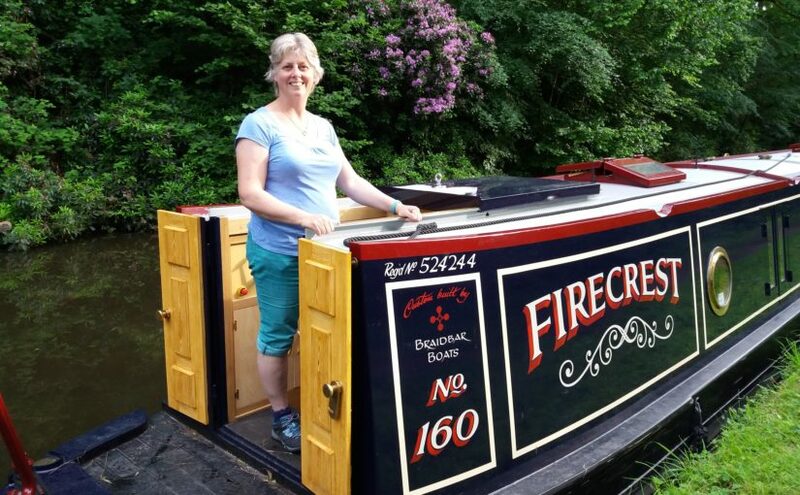 One of the nice things about friends is that they usually have a car and in return for a days cruising on the canal they took us cruising the countryside. 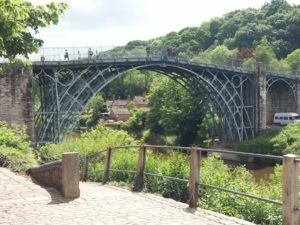 After 5 months afloat we don’t miss the Tarmac but it was good to cross the county boarders into Shropshire to visit Ironbridge and the surrounding area with them. 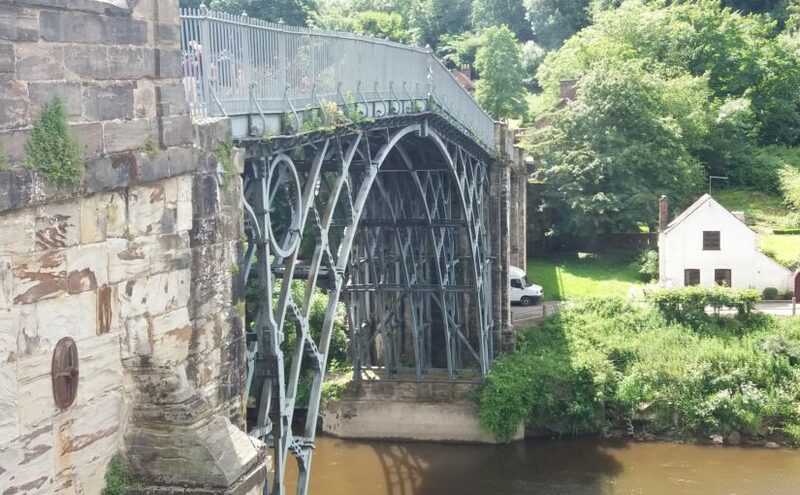 The 30m Iron Bridge spanning the River Severn was built 1779-1781 by Abraham Darby III. 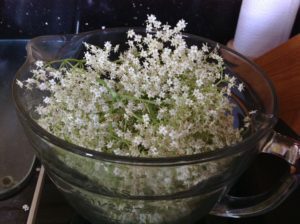 His Grandfather, also Abraham Darby, had worked out how to smelt iron using coke rather than coal making it a lot more economical. They also built the hotel as the place attracted visitors right from the start. 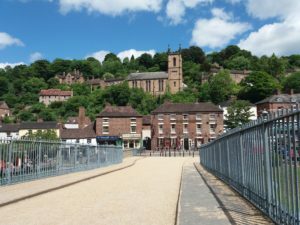 A few miles down the road/river is Coalbrookdale where the Coalport Museum is. Another fascinating place brought alive through the guided tour that we took. I’d never stopped to think about why bone china was called bone china, but there is a fairly obvious reason, it is 50% crushed bone mixed with China clay and Cornish stone. The industrial revolution was now in full steam. 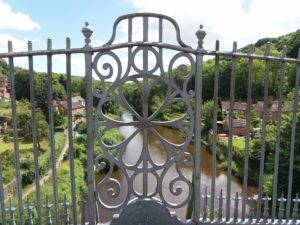 The convergence of a canal to deliver coal for the kilns and the river to bring the clay and stone from Cornwall led to Coalport being able to make tableware economically and more available to everyday folk. What we saw as a fascinating peaceful place was probably far from it in the 19th century. 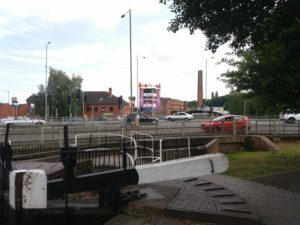 We got very excited seeing the canal terminus, but alas it is now only a short length and cruising to Ironbridge by canal or river isn’t feasible although next week we do plan to cruise downstream from Stourport on the Severn. 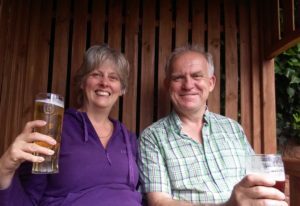 We did do and see a lot lot more with our friends but perhaps that had better stay off the blog. Sadly I was engulfed in a fit of the giggles when the tour guide showed us the sagger maker’s bottom knocker so no more photos. 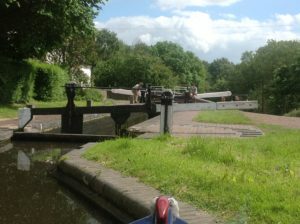 We’ve been moored up in Wolverley for 5 nights now. Such a different sort of week to last week, when we covered so many miles to get here and now we’ve been able to enjoy exploring our location a bit more. 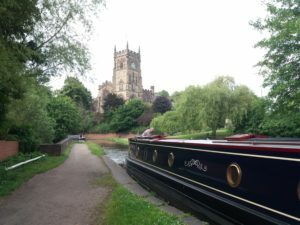 From Braidbar to Wolverley was 94 miles with 74 locks (including our little detour to Stourbridge) We did it in 10 days, some long and some relaxed. 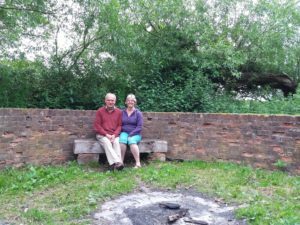 We got sunburnt, very wet and wind blown, we fixed one unhappy toilet and “we” lost 2 mooring chains and for all the good it did, completed our first ever postal vote in a general election. The first thing we found in the village was the pound for stray animals carved into the Rock. I hope they don’t use it for over enthusiastic boaters as well because we’ve had a good time this week with all our visitors. Hence the lack of posting this week. Sorry. Yesssss we’ve arrived. And moored up for the week so we can spend some time with friends in this area. 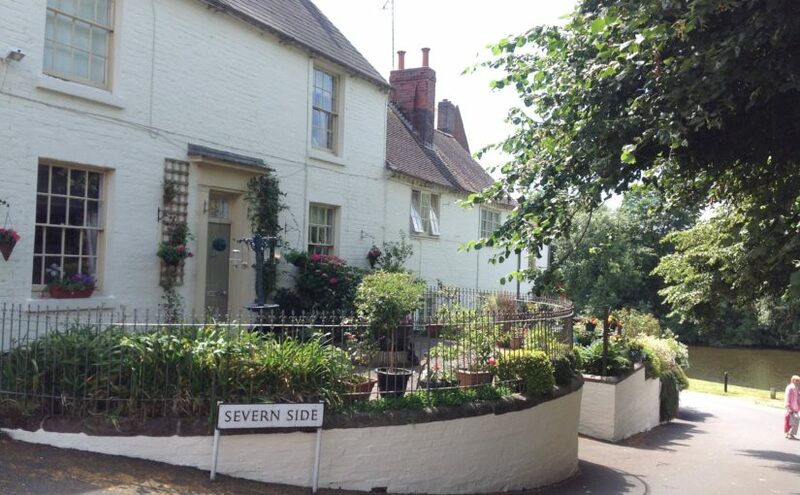 But first, being Sunday, we found the local church in Kinver and were warmly welcomed at St Peters. We’ll be back to explore the village properly later in the week. Looking at the crevices in these rocks I’m assuming it must be fairly soft to have been able to build the canal and locks through it. 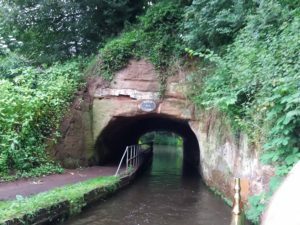 4 miles and 3 locks and 2 tunnels. Tomorrow I’ll be spring cleaning the boat ready for our visitors! 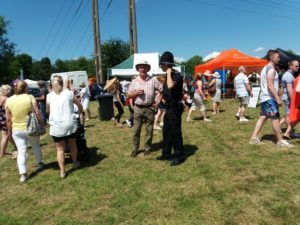 “…with lots of inspiring gift stalls, crafts, jewellery, clothing, home bakes, fine foods, and general stalls of good quality,…..” Mmm, that’s open to a lot of interpretation. 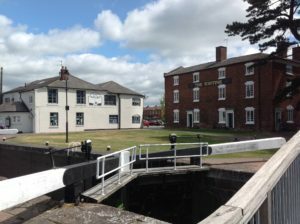 However we set off bright and cheerful turning off the Staffs and Worc canal onto the Stourport Canal for the 2 miles it would take us to reach the Bonded Warehouse at the end of the Stourbridge Town arm. 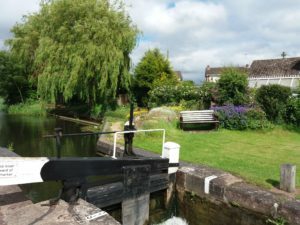 This route takes us through 4 beautiful locks, but as are most locks, they are deep and dangerous,and the water rushes through the gate paddles quite ferociously. it makes for a smoother ride to open the ground paddles first. The next lock also held some newbies, A brood of 8 or so newly hatched ducklings were exploring inside the lock with their mum. 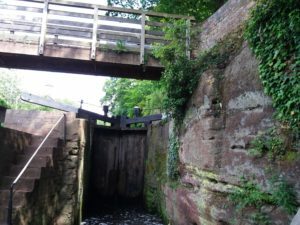 As the lock was empty there was no way we could encourage them out. 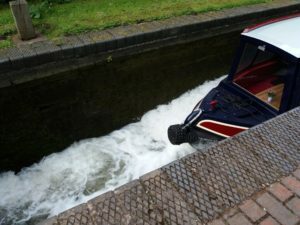 Eric’s driving skills were put to the test again, trying not to squash any of them between lock side and boat. This time I only half opened the ground paddle so the water trickled in. 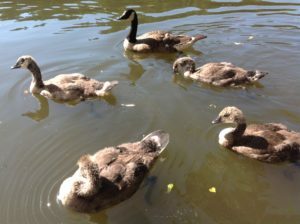 Sadly one of the ducklings did suffer. 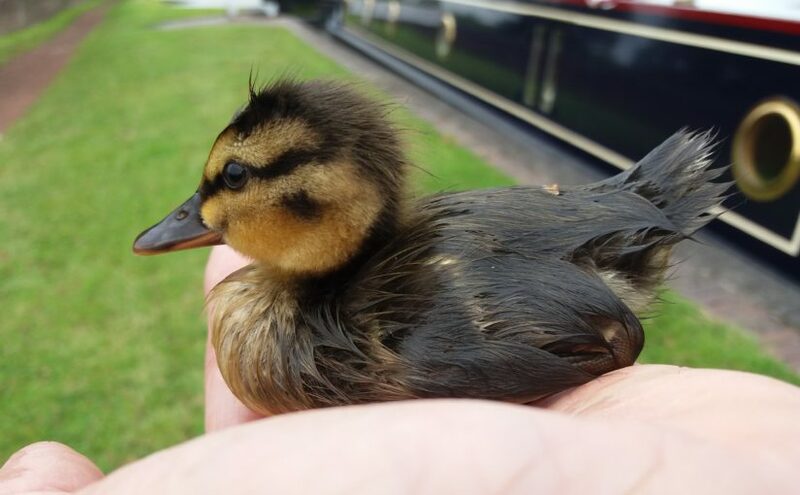 We could see all the others paddling furiously and quacking loudly, but this little one just bobbed about looking very bedraggled. As soon as there was enough water in the lock I was able to reach down and scoop him out. He didn’t make any attempt to struggle and it was another 5 minutes before he could stand up. 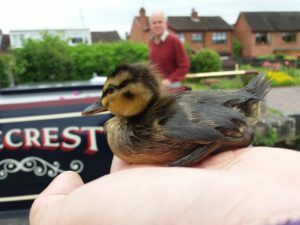 Once the lock gates were opened we were able to usher the family to the safety of the reed bank and I reunited little ducky with his family. We don’t know if he had been injured or was just too small and young to cope. 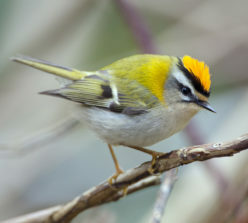 And I can’t be sure he’ll survive as he still had wet feathers. But hopefully we gave him a fighting chance. 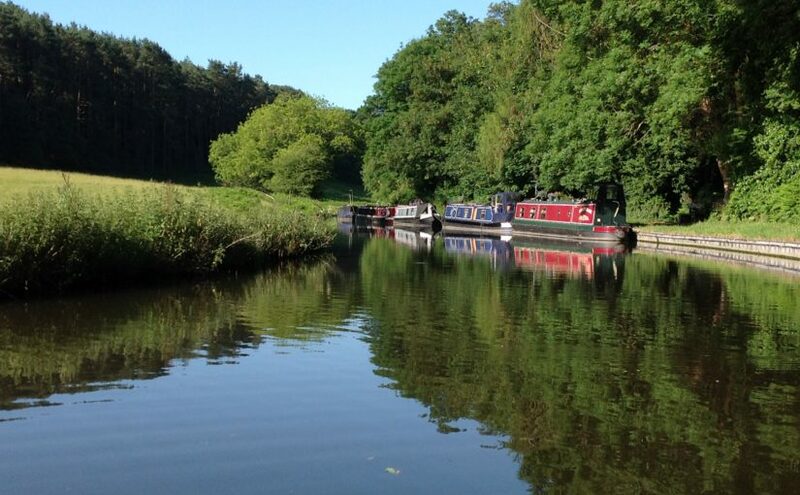 Usually the ducks and ducklings just get swept around the boats in the open canal and aren’t in any danger. But 18 tonne o’floating steel can’t stop instantly and not a lot will survive unscathed being squashed by one. The rest of the journey to Stourbridge was uneventful. The town itself had some fine old architecture but it was overpowered by modern concrete. We weren’t inspired to stay. On the positive side we did find an independent shoe shop that was able to find some waterproof shoes that fitted Eric perfectly so it wasn’t a wasted journey. 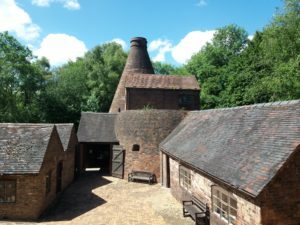 We might return to explore another day because there is a glass making tradition in Stourbridge and although I saw signs pointing out various glass ‘venues’ I didn’t actually find them. 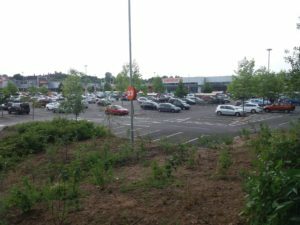 Just to add, there’s a lot of contemporary architecture that I love, but concrete shopping centres aren’t my favourite. 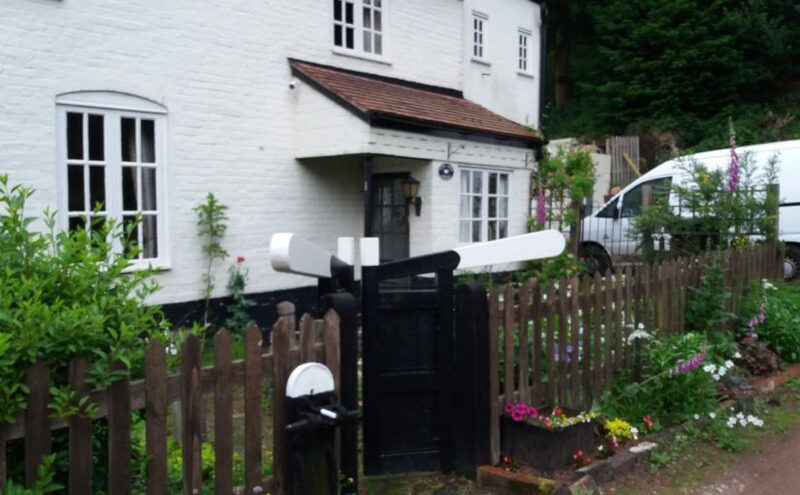 We spent the night moored in Kinver. 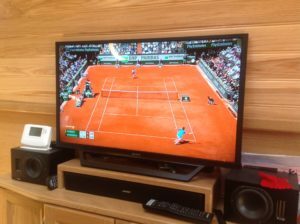 We had a lazy start to the day which meant that I switched the TV on to watch Andy Murray in the semi finals of the French Open. But the desire to cruise got the better of us and we set off after lunch. 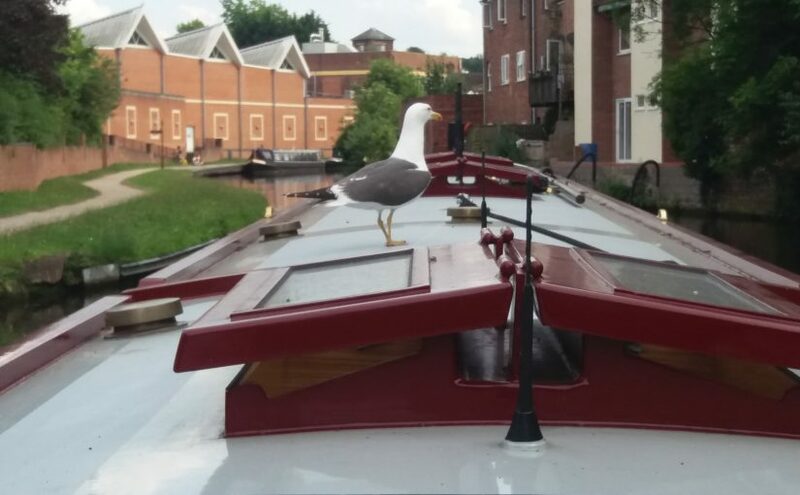 We joined a queue for our first locks, Botterham flight, so whilst I watched another set of tennis, Eric went to help the boats ahead of us. I did chuckle when he commented on his achey muscles. After a short stop to pick up water. 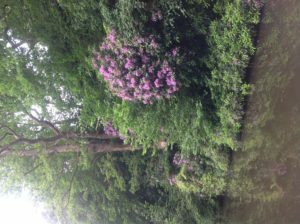 We found a rather beautiful mooring spot where the rhododendrons where still in bloom. Just before bridge 34, Prestwood. Our map pointed out the ruins of a round house in the vicinity. So after tea we set out for a walk to see if we could find it. We assume this is it, it didn’t look like a ruin to me but some sort of a shelter/corral and it had been used/misused for fires in the middle. Either way it was ideal for a bit of fun taking time delay photos with the two of us together for a change. and NO rain while we cruised.